Belle Forest Animal Hospital is a complete boarding facility. This includes our posh ?Cat Suites? 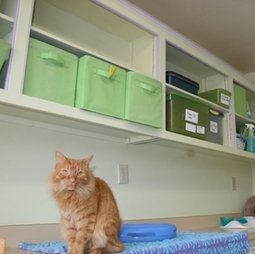 which has cat condos and can provide individual playtime in our sunroom. For dogs, we have a facility located downstairs with spacious runs. Our canine friends are walked several times a day at no extra charge. Our astute kennel staff will alert our doctors if your pet needs attention.